Caffeine occurs naturally in over 60 plants including coffee beans, tea leaves, kola nuts, yerba maté, guarana plants and cacao pods. Immature green coffee cherries, which are the source of coffee beans. Caffeine is added to food and drink items as well as to certain drugs and the Food and Drugs Administration (FDA) defines caffeine as both a drug and a food additive. Drinks that commonly contain caffeine include tea, coffee, energy drinks, Coca-Cola and hot chocolate. Caffeine content of select common food and drugs. 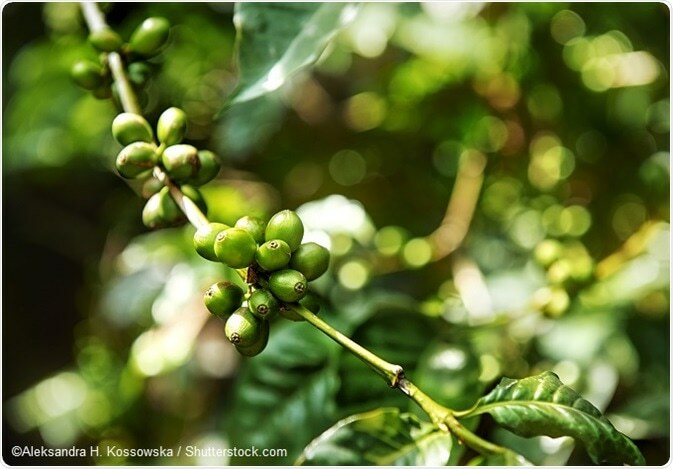 In the plant kingdom, caffeine is thought to act as a natural pesticide. Seedlings contain more caffeine than older leaves, which protects them from being eaten away by insects. High concentrations of caffeine are also found in the soil surrounding coffee bean seedlings, which is thought to prevent the germination of other nearby seedlings and enhance the coffee bean’s survival. The most important source of caffeine worldwide is the coffee bean. This is the seed of the coffee plant from which coffee is brewed. The exact amount of caffeine contained in coffee beans varies greatly and depends on several factors such as climate and soil type. One serving of coffee usually contains around 40 mg of caffeine in a single 30 ml shot. Drip coffee contains around 100 mg in a 120 ml cup. Arabica coffee normally contains less caffeine than the robusta variety. In general, dark-roast coffee has less caffeine than lighter roasts because roasting reduces the caffeine content. As far as tea is concerned, pale teas such as the Japanese green tea gyokuro contains a higher amount of caffeine than darker teas such as lapsang souchong. Chocolates made from the cocoa bean contain a small amount of caffeine. A 28 mg serving of milk chocolate contains as much caffeine as a cup of decaffeinated coffee. Caffeine is also used in soft drinks such as Coca-Cola. Typically, a serving of Coca-Cola contains around 10 to 50 mg of caffeine, while energy drinks such as Red Bull can contain 80 mg or more of caffeine. One main ingredient of energy drinks is guarana, which contains large amounts of caffeine.